Sweet Pea (Lathyrus odoratus): growing, planting, caring. Lathyrus odoratus - the sweet pea - is a flowering plant in the genus Lathyrus in the family Fabaceae native to southern Italy. It is an annual climbing plant growing to a height of 1–2 metres (3 ft 3 in–6 ft 7 in), bearing pinnate leaves with two leaflets and a terminal tendril that twines around supporting plants and structures. The flowers of the type species are purple, 2–3.5 centimetres (0.79–1.38 in) wide but they are larger and very variable in colour in the many cultivars - including pastel shades of blue, pink, purple and white, and bi-colours. The annual species, L. odoratus, may be confused with the everlasting pea, L. latifolius, a perennial. Outside: You can sow directly in open soil from mid-May and the flowering will take place late. Wait for the earth to warm up enough - if the nights are still cool (less than 10 ° C) it's still a little too early! Sow in pits: dig a hole every 15 cm deep, fill with potting soil, prick 4 to 5 seeds by sinking 1 cm and water. Inside: Sow under shelter from the month of March. 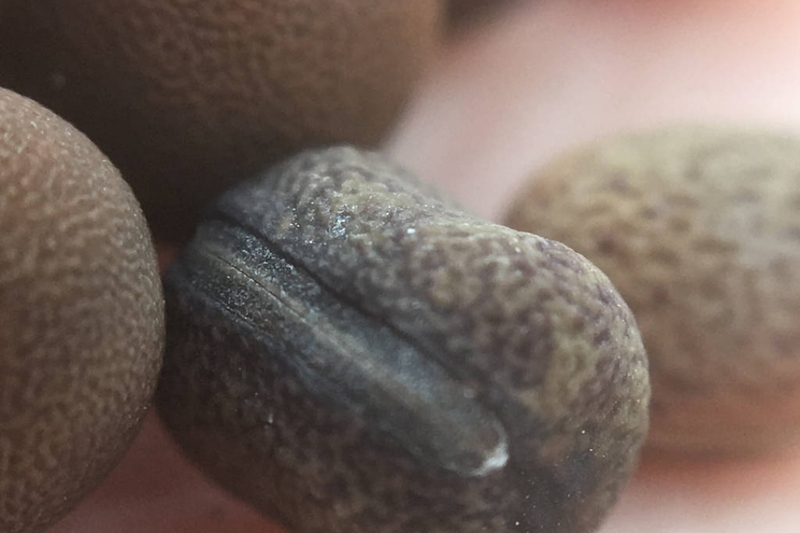 Soak the seeds in a glass of water for 12 hours before sowing to accelerate emergence - you will notice that they swell and turn a nice brown color! The sowing is done by depositing 3 to 5 seeds in a each hoe and by covering them with 1 centimeter (a half inch) of good compost. Caution: transplanting is quite delicate since the roots are relatively fragile. Use pots big enough to put them in open soil without touching the root ball or the roots. Pro tip! Sow some of your seeds under shelter, and the other a little later, directly in place. You will have two blooms! Once the seedling have emerged, you should thin it out. Keep one plant per spot. 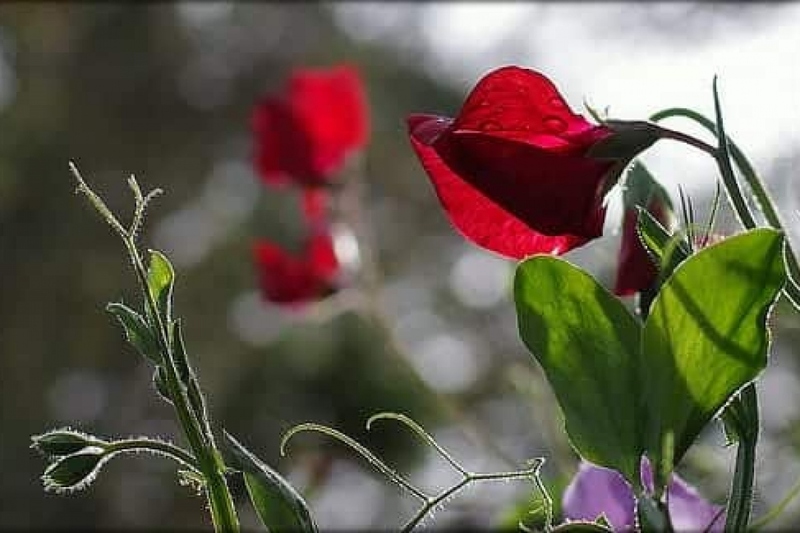 The sweet pea is not very demanding with the earth: a poor soil will be enough for it, even if humus accelerates the growth and multiplies the flowers. On the other hand, it will need sun and its small tendrils fear the violent winds. You can quite adorn a terrace or balcony with potted peas. Spread a bed of clay balls at the bottom for good drainage, making sure that the pot is well drilled at the bottom. Then fill the pot of potting soil for flowering plants. Ephemeral annual! At the end of the season, remove the withered plants - to make space. Water seedlings in fine mist, maintaining the soil always moist - if in a pot make sure you use drainage pots. After a few weeks, watering once a week should be fine. In case of drought, check regularly, as peas might cease flowering - and you don't want that do you? Pinch the seedlings to stimulate the shoots. Vigilant deadheading once or twice a week will prolong the blooming period ! Guide the stems of your sweet peas on their stake to help them climb. At the end of the season, let some flowers grow fully for seeds.